UMP | University of Minnesota Press Blog: BEA 2010 | Recount Poll: Fair or not fair? You voted, now here are the results. BEA 2010 | Recount Poll: Fair or not fair? You voted, now here are the results. Our self-described "Oh-so-very official This Is Not Florida recount quality control poll" was an instant success at BookExpo America last week. Hundreds of voters turned out to have their say about whether they felt justice was served in the still-controversial outcomes of two significant recounts in recent history: Bush/Gore 2000 and Coleman/Franken 2008. 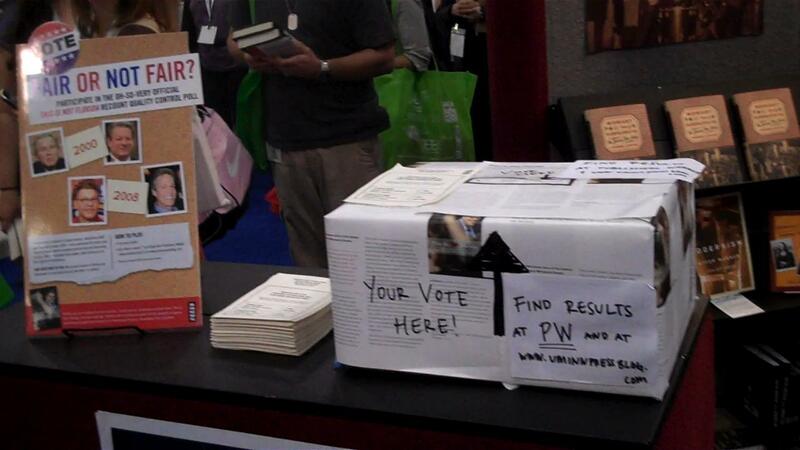 Our tally includes votes taken at BEA as well as votes e-mailed to us by midnight last Friday. While we must admit we are not entirely surprised by these results, still we were emboldened by the number of passionate verbal responses stirred by our poll questions. Some participants were visibly outraged at the mention of the recounts; some admitted they were likely outliers in their beliefs. One did a Stuart Smalley impression. None hesitated to have their say. -The 2000 presidential recount took 36 days (from Election Day to the Supreme Court's awarding the office to George W. Bush). The Franken-Coleman recount and legal episodes, from Election Day to Franken's swearing-in, took 35 weeks. -Author Jay Weiner covered the recount from Nov. 12, 2008, until July 7, 2009. For his efforts in covering the recount process, he received Minnesota's prestigious Frank Premack Public Affairs Journalism Award. -For this book, interviews were conducted with more than 40 key participants, including Franken. Four attempts were made to interview Coleman for this book; no response was received. If there were any nexus (from Coleman v. Franken) to Florida - besides the reappearance of some Bush v. Gore lawyers - it was that Democrats vowed after their defeat in 2000 to never again stumble on a recount playing field. Gore was altogether too polite in Florida, preferring to stay above the fray. Franken’s legal team was not polite. Fray was what they did, making sure that this 2008 recount bore no resemblance to Florida’s, not by a long shot. Click for more information on This Is Not Florida: How Al Franken Won the Minnesota Senate Recount.